Dragonlance, much reviled, much mocked but secretly much adored. Back when it was originally published I never read or played any of the Dragonlance Modules, or perused the novels. By the time Dragonlance was in full swing the guys I played games with had moved on to Car Wars. Jack over at Tales of the Grotesque and Dungeonesque once suggested Dirtbag Dragonlance - which still stands as a good setting idea, but I am curious if there is anything to be salvaged from Dragonlance that could make a fun game without the inclusion of Monster Trucks. Also Beyond Castle Cadwell is such a waste of a good design idea that I may have to stop reviewing the B-Series of modules. it’s the first. The title is good at least, and the module does include both dragons and despair. Published in 1984, Dragons of Despair is a work by Tracy Hickman, who also wrote Rahasia, which I reviewed a while back. Hickman has a signature style, one I detest, but it’s absolutely his own, as much a Gygax’s painstaking treasure accounting and bloodthirsty trap advice is his. From what I can tell the marks of a Hickman adventure are complex story, evocative detail, player handouts, high fantasy and a moral impulse. The introduction to Dragons of Despair is emblematic of this sensibility, and lays out an odd set of GM instruction in a more poetic context – a piece of creative writing about how the GM is playing the role of some ancient lore-master/historian/demigod rather than acting as an impartial referee. It’s perhaps a subtle difference or a hokey one, but I think the idea that the characters are the sort of people that ancient semi-divine robed spirits would be interested in watching is a fundamental difference between a Hickman adventure and the traditional D&D mindset. It also sadly creates a world where plot immunity is encouraged for player characters. The rules don’t make dying harder, but the future destinies of the recommended party members seem to. The odd thing about Hickman's modules (the two I've read) is that within the plot driven railroads and the mechanical problems caused by the plot's strict morality there are some cool encounters and good ideas: metal poor world with steel coinage, elevator encounter, loss of Clerical magic, and the Draconic army that seems modern in it's (fascist) ethos massacring the heck out of high-fantasy land. There must be something salvageable from these ideas. The problems I have with the Hickman game world are many, but at the core Dragons of Despair (and Rahasia) appear to be an effort to use the medium of table top games to tell a different kind of story then the picaresque of most D&D games. 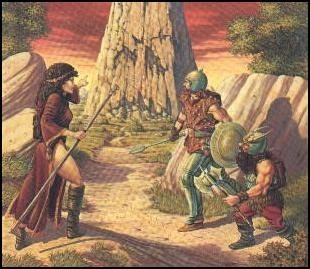 They strive to be sweeping and epic, and while my experience playing suggests that this approach rarely works, that any sweeping epic moments must arise from the players own goals derived from observation and interaction with the world rather than the ones predetermined by a GM or adventure writer, I can’t say that the goal of Dragonlance modules wasn’t a novel one. IT was also a very successful goal apparently, as the novels and modules of Dragonlance were D&D’s flagship world for quite a while, and beloved by a lot of players. 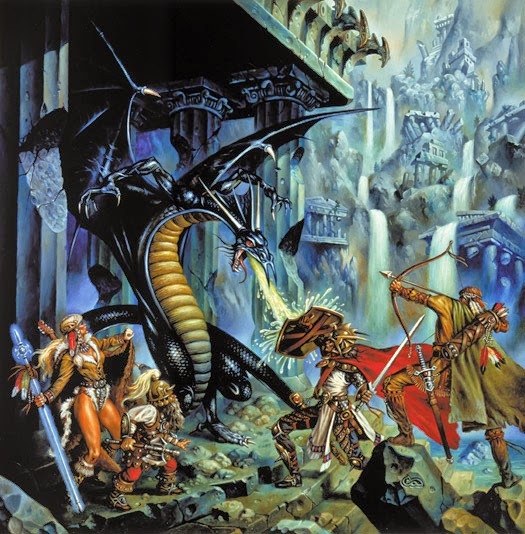 What’s awful about Dragonlance, and it is awful (though not without redeeming features), isn’t it’s goals or the creativity behind it, it’s the world it evokes and the way it tortures D&D’s mechanics to make that world work. 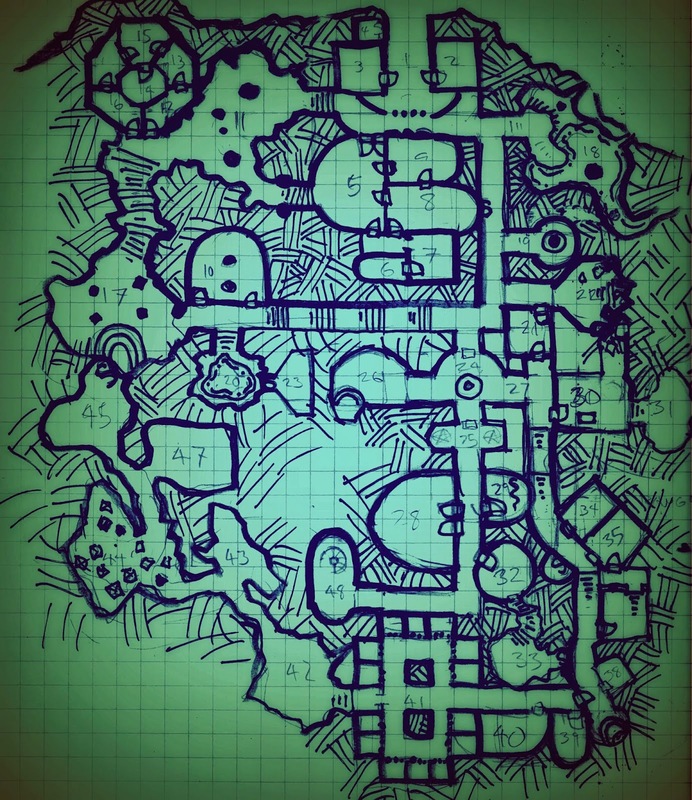 Hey - One Page Dungeon Contest, last minute submission below. Hopefully this will exercise my desire to make flying monkey related adventures. 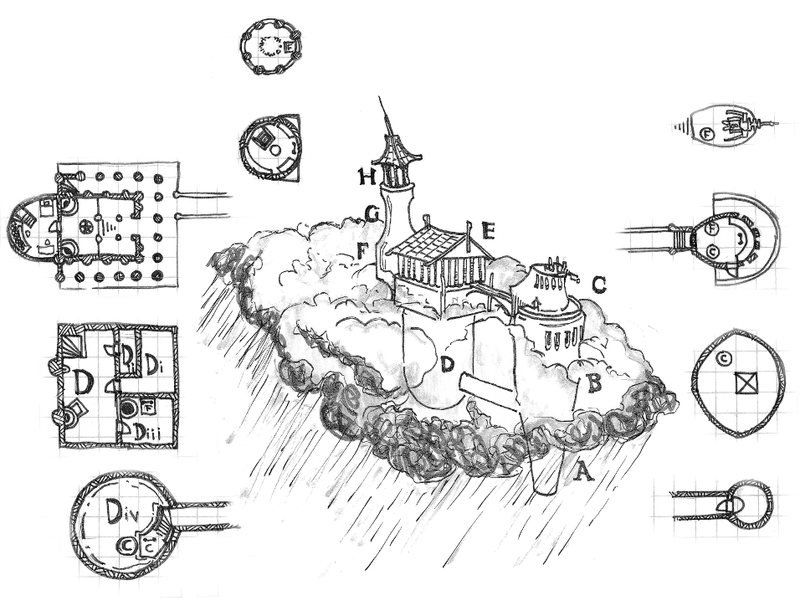 B-3's first level, redrawn for sense. The berry wines and honey-mead have been flowing for a week now, and even the lowliest hired labor from the terrestrial sphere and the less respectable outlying villages have been basking in the absurd plenty that the impending wedding of the fey Queen Azure to the mysterious Scarlet Dragon Knight trails in its wake. Azure in her typical grandiose way, only to be expected from a self-proclaimed “Daughter of the Earth Goddess”, “Ever Truthful Oracle” and “Czarina of the Peaceable Forest Peoples” has invited every being with even the slightest connection to the fey courts. The small hamlet of Bobble, in the lee of her great castle is overflowing with intelligent animals, gnomes, lesser fey, dwarves, the more civilized goblin folk and even occasional humans. Every low roofed toadstool hut has been crammed to its musty rafters as the more enterprising crofters take in guests, or rent their homes to traveling artisans while they camp in the woods. The eve of the wedding finally sees the tiny town at rest, though late night preparations continue in the castle, with the windows of its towers and enchanted bowers ablaze with multicolored light and the sounds of revelry. Yet not long after midnight this relative peace is disturbed when a huge explosion, and cacophony of unearthly howls, rumbling earth and cracking rock tears through the night. Man, elf, dwarf, gnome, boggin, sprite, badgerman, rabbitwife and mushroom people dash into the small fountain square at the center of Bobble and stare up at the castle bluff where the towers have shifted and a sulfurous light creeps downward like slowly dripping oil from the tangled bows of the castle’s living woods. An enormous tower of black smoke fills the sky coming from the collapsed central dome of the castle, it’s silver filigreed roof fallen. Firmly entrenched in the mid 80’s, and TSR’s trends towards higher fantasy adventures with clearly delineated good and evil, Journey to the Rock is still an exception after the unsettling (and often unnecessary) railroading of B5-B7 that seems to mark the beginning of a move away from sandbox play. Written by Michael Malone in 1985 doesn’t have the popularity or notoriety of much of the B series, I’m not really sure why this is, as there is much to use in Journey to the Rock, perhaps it came out at a time when D&D was trending away from the sort of vanilla world exploration fantasy that it represents towards the epic scripted adventures of Dragonlance, perhaps B8’s solid structure is lost underneath a coat of dullness that still makes it a bit of a slog to read. B8 doesn’t just return to the more open world popular in the early B series, it returns to the practice of giving tidbits of GMing advice, which is welcome. There’s advice on character death that focuses on wandering adventurers rather than henchmen as replacements. It’s an interesting choice when compared to the advice in B2, and which I read as a move in mid-80’s D&D towards a party of individual heroes vs. party as a band of desperate treasure hunters or wandering pack of mercenaries. The rather decent pre-generated characters show this as well, with typical fantasy backstories and quite good statistics, but without being overly long and complex. 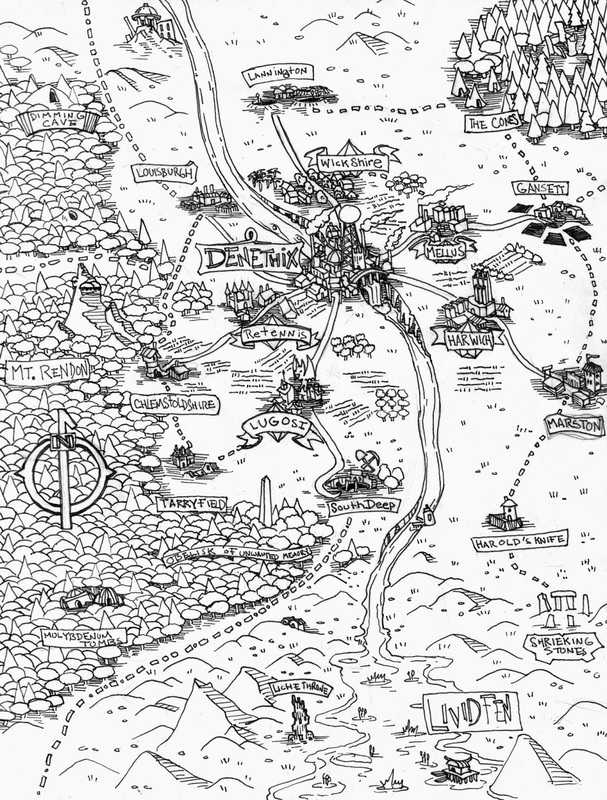 None of this is bad or especially good, just noteworthy as a signpost of the direction D&D was taking in the mid 80’s. Another example of the mid 80’s railroad/heroic adventure thinking in Journey to the Rock is the inclusion of optional encounters that are to be avoided if they might destroy the party. It’s a shame as the vast majority of these individual encounters are quite good, and beyond time pressure or avoiding hammering a wounded and foolish party of adventurers there’s no reason to avoid them. B8 is supposedly novel because it is primarily a wilderness adventure, but this is only partially true. B8 is an adventure that occurs in the wilderness, but it provides three ‘paths’ to the target location rather than a hex crawl to explore, though one could easily explore the empty hexes (squares actually) striking out across the map. There are simple, and seemingly solid wilderness travel and encounter rules, and some nice concepts embodied in the day and night encounter lists. The encounters themselves have tiny bits of character to them that go a long way to making them feel naturalistic (Forest ogre wears deer skull helmet, goblins send out raiding parties if the party kills their hunters) and while this isn’t much it’s better than a lot of modules - B series or contemporary. One issue is that the map represents maybe three days of travel at the rates provided (which seem high), making this a rather short wilderness adventure, though the density of the path’s inhabitants may slow a party down. Another positive and noteworthy element of Journey to the Rock is that many of the monsters are unique, and many are not outright hostile. This is a huge departure from B7, B6 or B5 where good and evil are drawn sharply and creatures are either friendly or instantly aggressive. The dullness of Journey to the Rock begins with the plot, despite containing some classic swords and sorcery elements such as the ancient city phased out of time and seeking to return. What’s surprising here is that the core ideas are fun, but they are presented in a blunt, rules heavy manner, and worse the interesting bits aren’t expanded upon while the minutia is. The party is accosted by a merchant in the wilds who wants to offer one of them a job from a local wizard and noble. The party travels to a manor where they are given a job to trek to a distant glowing massif and recover an ancient amulet to allow the wizard to bring his lost city back to the world. This is presented as an absolute good, which is a bit strange, and the hook itself is “go get the wizard something for money” is so trite and miserable. Weirdly the module writer thinks this hook deserves several pages to set up. After accepting the quest the adventurers wander off into the wilderness, presumably along one of the three trails on the map they receive. The North trail goes through some mountains and the abandoned ruins of the phased city. The Western trail wanders through forest and the Southern barrens or a desert. All three paths lead to an interesting set encounter and a puzzle involving the nature of the rock itself. Below is a sample from the Player's Manual I've been preparing for the HMS APOLLYON. 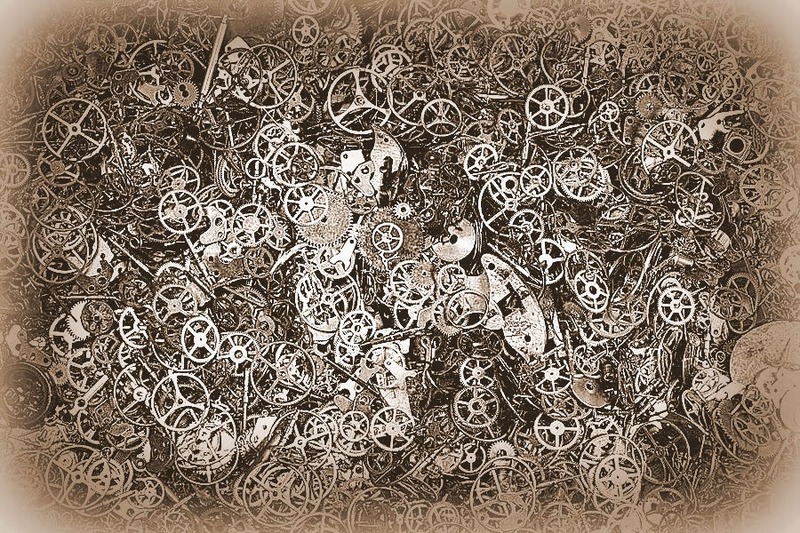 It's not just a look at font and format, but the topic itself may be useful both to players and as a worldbuilding idea. I think it is helpful for both GM and players to have some idea of what's valuable in a setting, especially as one moves farther away from the fantasy norm. Players have a tendency to steal anything that isn't laid down, and try to sell it. For example, in the last game of Wampus I played the party didn't find much treasure amongst the amusingly re-skinned retired adventurer fortress that is Search for the Unknown, but we made up for the lack of portable wealth by smashing up some marble thrones and selling the larger chunks. This sort of behavior is baked into the Apollyon, and giving both player and GM an idea about what's worth dragging back to the gates of Sterntown is important to the setting. Tenkar's Tavern is having a tiered contest dubbed "OSR Superstar". 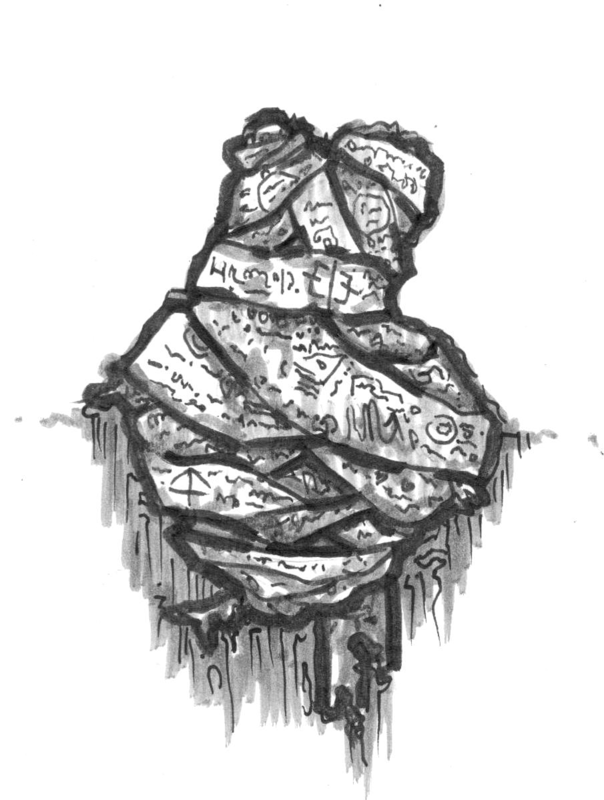 Now given that the concept of the OSR is a maze of delusions without a distinct meaning I don't really know what it means, but the Tavern managed to get 330 entries for the first round, winnowed down to 50 in the second. My own entry in the first round was one of those picked by two of the three judges, which surprised me. The next round fast approaches and I am hard at work on my monster, but in the meantime I figured I would share my last entry. Tenkar has already posted the raw text of the entry, but here's the actual item as submitted. Sure ASE 1 by Patrick Wetmore has some nice maps in it, but I went and decided to draw the area map around Denethix (ASE's 'point of light') in my own overland style. Use it how you will - player map immediately comes to mind. It's only vaguely to scale, but that's part of the fun. Use them however you like.